STORRS — The best offensive clubs the UConn women’s basketball team has had for the last three decades are also among its best at the defensive end. The Huskies’ “dirty little secret,” as veteran DePaul coach Doug Bruno has said for the past decade, is how well they defend. 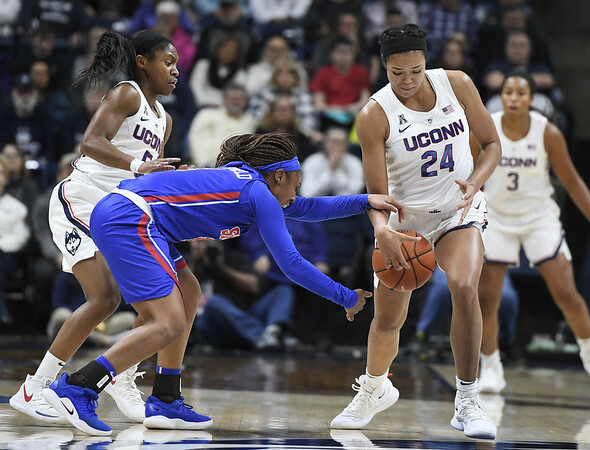 But with the last two national Defensive Player of the Year winners — Kia Nurse and Gabby Williams — now in the WNBA, UConn has gone almost game to game in finding ways to keep opponents off balance and off the scoreboard. Against SMU on Wednesday, it was with a full-court trap. The third-ranked Huskies held SMU to 26.2 percent shooting from the floor and forced 24 turnovers, helping them to big advantages in fast-break points (21-6) and points off of turnovers (26-3). Their 79-39 rout of the Mustangs in American Athletic Conference action before an announced crowd of 9,402 at Gampel Pavilion left them feeling good about their effort. Collier (22) and Samuelson (21) combined to outscore SMU on their own. But the seniors received help from Christyn Williams (12) and Megan Walker (11). Crystal Dangerfield didn’t hit double figures in points, but should have had it in assists if not for a blown layup each by the seniors. The junior finished with eight assists and just one turnover and had the Huskies on the run. Twenty-six of UConn’s 31 baskets had assists attached to them. “We play off of that type of energy, and it really gets our whole team going when we can play that aggressively,” Samuelson said. “It’s something we’ve been working on, and these past two days we really emphasized it. UConn (17-1 overall, 6-0 AAC) is second in the league to Central Florida in scoring defense (53.2) and first in field-goal percentage defense (33.2). In its best win of the season, at Notre Dame on Dec. 2, it held the Irish to just 71 points. Even in its loss at Baylor, the Bears managed just 68 points. SMU (7-12, 1-5) isn’t Notre Dame and/or Baylor and not even a top 100 team. But maybe the Huskies found another thing that they can add to their arsenal heading into February and March. “We’re trying to get ourselves some easy buckets and try to get the game going a little quicker,” UConn coach Geno Auriemma said. “We want to create as many possessions as we can. I thought it worked out pretty well. The only down note was SMU’s 48-37 advantage on the boards. UConn shares the AAC lead with UCF and the teams will have a showdown at the XL Center in Hartford on Sunday. Posted in Newington Town Crier, UConn on Thursday, 24 January 2019 21:08. Updated: Thursday, 24 January 2019 21:21.